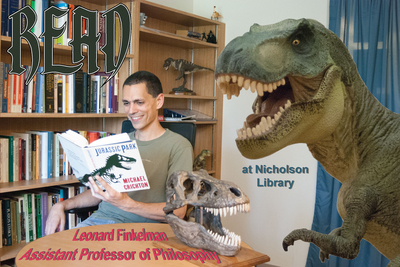 Leonard Finkelman, Assistant Professor of Philosophy, reading Jurassic Park, by Michael Crichton. Armstrong, Lige and Nicholson Library Staff, "Leonard Finkelman READ Poster" (2015). READ Poster Gallery. Image. Submission 151.